Last week I recieved a phone call from one of our customers. We had painted her house a couple weeks ago (and it turned out GREAT) and a few days after we finished she noticed she had some discolorization on her house. She described it as ‘spots, kind of like when cement cures.’ I was flumoxed and told her I would have to come out to see for myself. When I got there I noticed that her brand new beautiful exterior paint job had a white film on her tan house, and not just in spots, but EVERYWHERE. The other half of my crew, Eddie, said he had never seen anything like it in 25 years of painting, but I knew almost immediately what it was – You see Eddie spent most of his life paintng in Texas, where the fall weather doesn’t fluctuate like it does in Colorado. 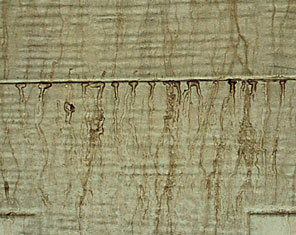 What we were looking at is a condition, usually experienced on exteriors, know as ‘surfactant leaching’. Modern paint is much more that a coloring agent and water. It is made of many chemical compounds that, as they cure, create a hard, durable, fade-resistant covering over your home. Many of these substances are powders ground up and added to various liquids and some of these substances do not so much dissolve as become suspended in the liquid until applied and allowed to dry. These powders can actually have a gritty texture, which doesn’t allow for even spreading over a surface, so paint is mixed with surfactants, or soap, to allow for even flow from the brush. Typically, as the paint dries, these surfactants dry with the paint and everyone is happy. However, as the weather cools and humidity goes up in this part of the country, paints can take longer to dry. This means all the ‘stuff’ that makes up paint has more time to separate. One substance that can come to the surface, or ‘leach’ up is the surfactant. When it dries it creates the film on the paint surface that can be anywhere from off-white to dark brown and makes the paint job look awful. The good news is it is just soap – a good rinsing usually will solve the problem. So we drug out the pressure washer and rinsed off our new paint job. Now the house looks as good as the day we finished painting and should have no more problems with chemical leaching as the paint is thoroughly cured. No harm, no foul! So be aware that when you paint outside this time of year many factors can change the way paint reacts to the weather. And if you aren’t sure what’s going on with your project, feel free to call the HappyPainters. We’ll do our best to make it all clear to you!